Pictures of Cows - Being creative taking pictures of cows. The closest I have ever come to being killed or injured on a photo shoot was while taking pictures of a cow. On Photographing Cows... and pictures of lions, tigers, baboons, chickens, eagles, mice, turtles, dogs, cats, elephants and more. I have photographed a Lion, a Tiger, a baboon, chickens, eagles, mice, turtles, dogs and cats, elephants and more…but the hardest animals for me to shoot for my animal antics series of images are…cows! 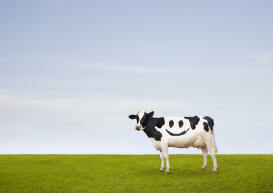 Yes, creating funny cow pictures is one of the hardest things for me to do. Cow transformation is not easy. A Close Call during a cow photo shoot. As a matter of fact…the closest I have ever come to being killed or injured on a shoot was during a cow shoot. I was trying to get a good, clear shot of the cow’s chest. To get more space we decided to have the cow stand with it’s front legs up on a platform. I would crawl under the platform and shoot directly up at the cow’s chest. I had done a similar shoot of a Tiger and the platform idea had worked well. This time, just before I was to crawl under the platform I decided to shoot a few frames from in front of the structure. I had barely squeezed off five frames when the cow began to hop up and down on the platform. The platform promptly splintered into pieces with the 1,400pound cow still hoping up and down where my chest would have been! Photographing cows…for my animal antics series is difficult for several reasons. For one thing, I haven’t figured out how to get a cow to stand up. 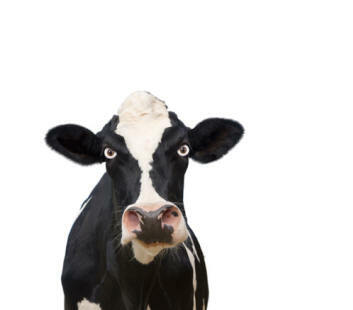 For another, the most popular breeds are Holsteins…white with black spots. It can be particularly challenging, especially in bright sunlight, to keep the detail in both the whites and in the blacks of an image. Cows also tend to be dirty and somewhat un-responsive to direction. And finally, they have great difficulty in taking on anthropomorphic poses. My last cow shoot actually worked out very successfully…all the above considered. I stretched out a 20’x20’ “silk”, a transparent, white cloth, and had the cow stand under it. The resulting “soft” light made it much easier to keep the detail in both the darks and the lights. The soft light also helps facilitate my imaging by allowing me to rotate parts without as much concern about directional light being in the wrong direction. An animal trainer was on hand to help “pose” the cow as much as possible without stressing the animal. The animal trainer also made sure the cow was clean right down to polishing it’s hooves. Cows are highly symbolic creatures. Having been domesticated for over 5,000 years, Cows are seen as gentle and even loving animals. They are also perceived as nurturing, and in fact do form strong bonds with thier own offspring even nursing them for up to three years. Finally, cows provide us with a bounty of products including milk, cheese and butter. 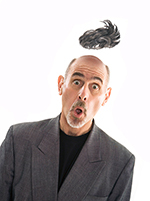 Holsteins in particular tug on our heart-strings with their whimsical black and white patterns. This appeal of cows has many of us collecting cow memorabilia and chuckling at cow cartoons, dancing cows and even stories of cow tipping! If you are looking for miniature cows, the smallest type of cow is a breed called Dexter, which was bred for household living. Holstein’s spots are similar to fingerprints in that no two are alike. It is possible to lead a cow upstairs but not downstairs, because a cow's knees cannot bend properly to walk back down. The age of a cow is always based on her age when she calves. This varies with different breeds. In other words, your record doesn't begin until you've had a calf, if you're a cow. Columbus brought cows with him on his second voyage. It became a law that each ship had to have one cow for every five people. 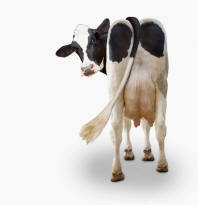 Cows release about 100 million tons of hydrocarbon annually by releasing gas, mostly by burping. Milk is good for cooling your mouth after eating spicy food. Milk products contain casein, a protein that cleanses burning taste buds. 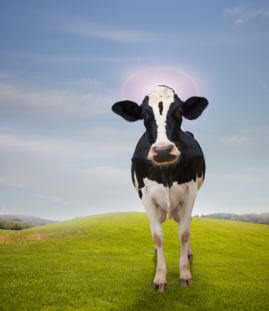 Cows have almost total 360-degree panoramic vision. A cow is a mature female (and who has had a calf) and a bull an adult male of a bovine family. A heifer is a female cow that hasn't had a calf yet. “Cattle” is the name for the whole "cow" family. There are about 920 different breeds of cows in the world. Holsteins give the most milk. Cows are very social animals. They will bond to some herd members while avoiding others. They communicate not just by “mooing” but also through body position and facial expressions. Dairy cows are judged in part by their “femininity”. Cows can weigh up to 1400 pounds or more and a 1000 pound cow will produce an average of 10 tons of manure a year.